The light of the full moon illuminates the curious scene presented on the top of this charming keepsake box. 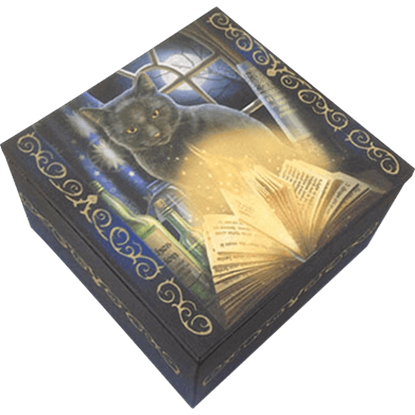 The Bewitched Trinket Box depicts a black cat staring out at you as it sits behind a glowing magical text. Once you have found your favorite set of tarot cards, be sure to keep them safe in a box that is just as decorative as it is protective. 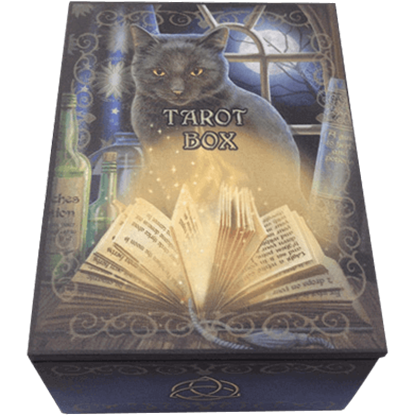 The Bewitching Black Cat Tarot Box will keep those cards intact in style between your readings. 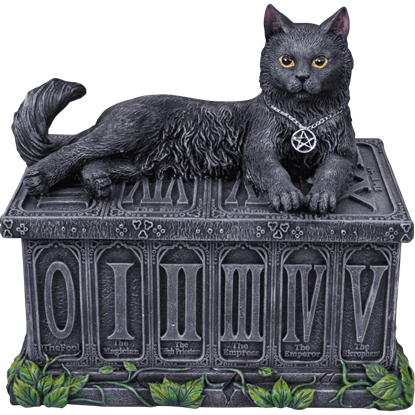 Featuring a gorgeous design by Lisa Parker, the Black Cat with Pentagram Trinket Box makes a great collectible for fans of fantasy artwork. 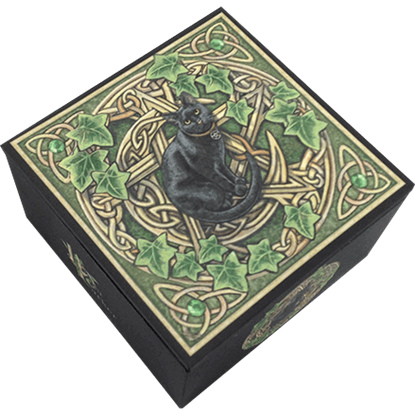 The cat sits on the pentagram design, which is joined with a crescent moon and ivy details. Hide your valuables in style, accent your home with an interesting center piece, or store your favorite trinkets in a beautiful box. 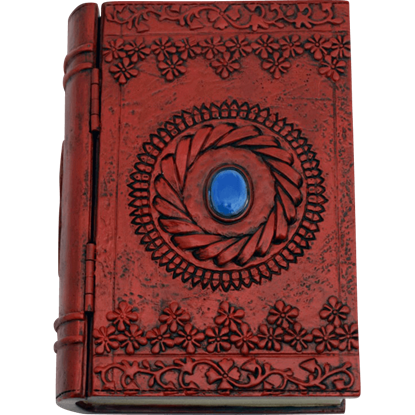 The Blue Stone Book Box is decorated with a small blue stone and looks like an old tome! Medieval Hindu and Buddhist texts describe the body as having seven chakra points. 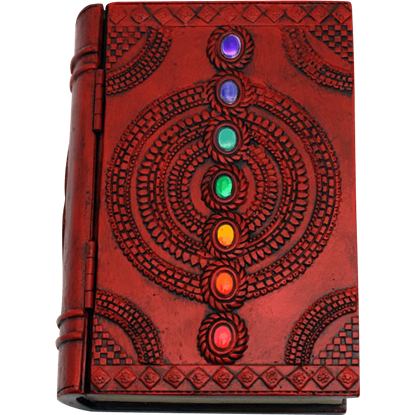 Each of those points is represented by a different colored stone on this Chakra Book Box. Store your favorite jewelries and small items in this box! Pendulums are ideal for dowsing, an activity performed in the ancient art of divination. 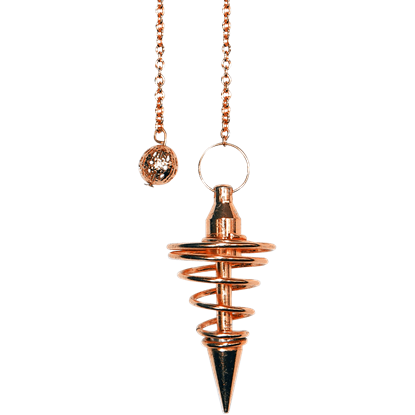 The Copper Spiral Pendulum is a great tool not only for dowsing, but also for wearing or displaying to add a touch of magic to your life. Keeping a record of your dreams can be a great way to learn to remember them after waking, and this box provides an excellent place to store your notes. 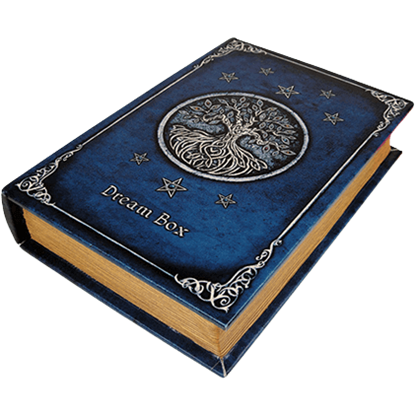 The Dream Book Box features a blue background with silver designs around the edges. Though no one knows for certain what the future holds, many have tried to discover what kind of fortune will befall them. 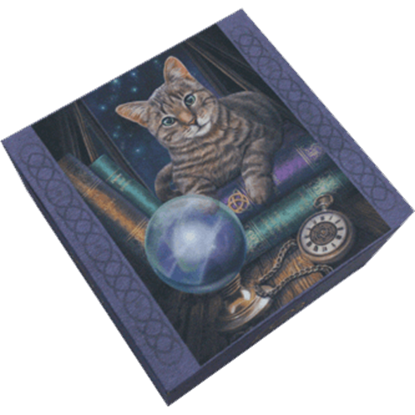 The Fortune Teller Box with Mirror shows a tabby cat lying on top of thick books, peering at a crystal ball. Do you want your fortune told? Beware the fearsome dragon guarding the tarot cards within the Fortunes Keeper Tarot Box, though it sleeps, it is always alert! 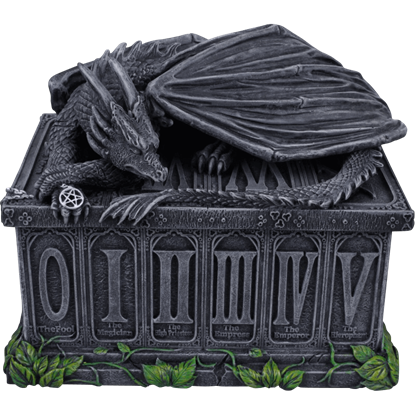 This highly detailed tarot box features a sleeping dragon on the lid. None may steal the fortune tellers card deck from the Fortunes Watcher Tarot Box while her feline familiar is watching. 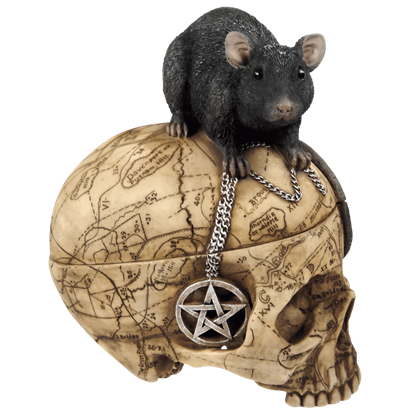 A yellow eyed black cat rests upon the lid of this tarot box, a pentacle necklace hanging around its neck. In the ancient art of divination, pendulums are used for a ritual known as dowsing. The Gold Spiral Pendulum is a great and eye catching tool for dowsing, and it is also a beautiful way to wear or display a touch of mystical charm.